As Audi grew increasingly confident with its ability to take on Mercedes-Benz and BMW, it turned its attention to applying the knowledge it gained from its rally program to performance-oriented models that were fully street legal. After launching several evolutions of the quattro coupe, the automaker took the first step towards building a full-fledged lineup of S-badged models with the 1990 S2 – a high-performance version of the Coupé – and the 1991 four-door S4. The positive response to both the S2 and the S4 convinced Audi’s top brass to design an even more extreme car that would serve as the brand’s halo. Audi didn’t want to spend money on developing a sports car from scratch so it chose to begin with an existing model, a common course of action in the auto industry. Less common was engineers had in mind: Perhaps impressed by the Mercedes-Benz 500E, Audi asked Porsche to help transform a mundane 80 Avant into one of the world’s quickest sports cars. The Audi RS2 Avant was presented on March 19th, 1994. Porsche designers added an aggressive front bumper with large air vents, a black radiator grille and aerodynamic 911-sourced door mirrors. The rear license plate was moved from the hatch to the bumper in order to free up space for a light bar that connected both tail lamps, a nod towards the wagon’s Porsche genes. RS emblems on both ends, red brake calipers and 17-inch Porsche alloy wheels mounted on low-profile tires rounded out the exterior updates. Buyers could choose from eleven different exterior colors including Nogaro Blue, the shade that is often associated with the RS2 Avant today. The RS2 Avant was powered by a Porsche-tuned 2.2-liter 20-valve five-cylinder engine fitted with a high-capacity turbocharger and an upgraded intercooler. Derived from the S2, the mill generated 315 horsepower and 302 lb-ft. of torque, enough to send the wagon from zero to 62 mph (100 km/h) in 5.4 seconds and on to a top speed of 162 mph (262 km/h). To put the statistics into perspective, a 1994 Porsche 911 Carrera took 5.1 seconds to reach 62 mph from a stop. These figures aren’t jaw-dropping today but they were downright impressive in the mid-1990s and the RS2 Avant was the fastest, most powerful regular-production Audi to date when it was introduced. Power was sent to all four wheels via six-speed manual transmission and a sport-tuned version of Audi’s quattro all-wheel drive system equipped with a manual differential lock. Four-piston calipers pulled from the Porsche parts bin and a sport-tuned ABS system helped keep the power in check, and the RS2 Avant also featured shortened springs and firmer shock absorbers. The sport treatment continued inside the car with electric Recaro bucket seats for the front passengers, a RS2-specific instrument cluster with white-faced gauges and a set of smaller gauges mounted at the bottom of the center stack that provided the oil temperature, the oil pressure and the battery voltage. Buyers after a fully-loaded wagon could order their RS2 Avant with automatic air conditioning, a passenger-side airbag, a sunroof and carbon fiber trim on the dashboard and the door panels. The RS2 Avant came standard with procon-ten (Programmed Contraction-Tension), a complicated-yet-innovative restraint system patented by Audi in the middle of the 1980s. In the event of a crash, two thick cables linked to the drivetrain retracted the steering column away from the driver and removed all slack from the front seatbelts. Alternatively, buyers could specify a front airbag at no extra cost. In spite of costing 98,900 Deutsche Marks before options were factored in, the RS2 immediately sent shockwaves through the automotive world and it proved massively popular all over Europe. Audi initially announced just 2,200 examples would be built but demand was strong and a total of 2,909 RS2 Avants had rolled out of Porsche’s workshop in Stuttgart, Germany, by the time production ended in July of 1995. Porsche announced its intentions to build cars for other automakers in 1989 and it took on production of the Mercedes-Benz 500E (w124) a year later. The agreement between Porsche and Mercedes essentially amounted to the latter outsourcing production to the former. Porsche took a different approach for the RS2 Avant and formed a joint-venture called Arge with Audi, meaning that Audi and Porsche split the profits generated by the wagon. The RS2’s success convinced Audi to forge forward with performance-focused models aimed at AMG-tuned Mercedes and BMW’s M division. The RS4, Audi’s next hot-rodded wagon, came in 1999 with a 375-horsepower twin-turbocharged V6. Audi’s records indicate at least two sedan versions of the RS2 were built in the mid-1990s. The cars were largely experimental and never intended for mass production. Is it kosher to link to related content? A RS2 is a rare sight in Europe, I can only imagine what it’s like pulling up to one in Canada! Classic. It’s come a long way to inspire the RS4 of today. What was really revolutionary in that time was that it was “hot” station wagon. Until then, the typical station wagons – think Mercedes-Benz S123 or Audi 100 Avant – were large and not sporty at all. At the same time there were some tuned up cars – usually hatchbacks made for rally sports homologation or larger luxury sedans – but these were niches either for young people or those seeking a fast luxury car. The Audi 80 station wagon was a bit leisurely and portly, so giving it the performance of a 911, and aiming at 911 customers who wanted more luggage space was something really new. 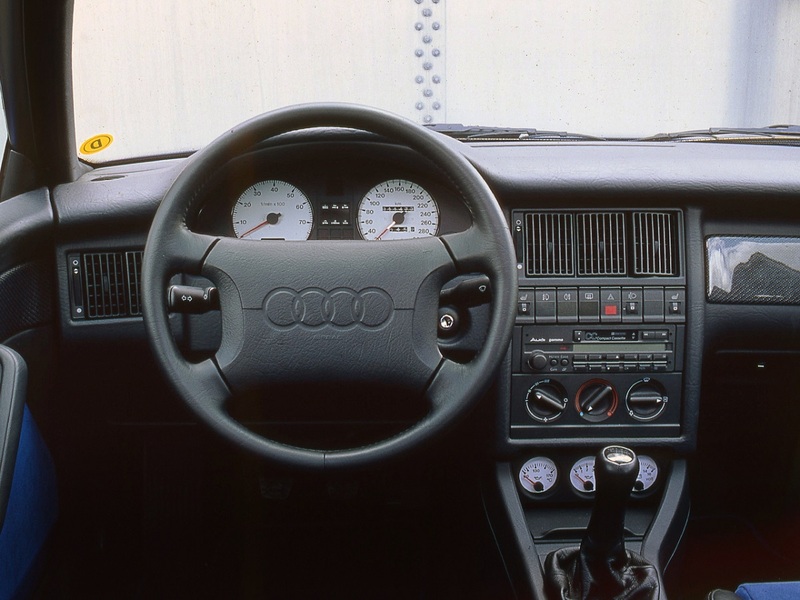 BTW, the instrument cluster itself was not RS2-specific (my Audi 80 quattro 16V, type 89Q, had the same instrument cluster), only the white-faces of the gauges. One correction regarding the instrument cluster: I meant the three instruments that showed oil, voltage and amps – I had those in black. The little LCD display (below the “Quick Check” display) might have been RS2 specific. The RS2 was a pretty revolutionary design, yeah. Even today there aren’t very many “hot” wagons except for RS-badged Audis, the E63 AMG and I guess Polestar-tuned Volvos, but those are few and far between as production is very limited. Thanks for the heads-up on the instrument cluster, bytheway.